In newer Photoshop Elements releases, you don’t see tools nested in pop-out toolbars, as you have in previous versions. Companion tools are contained in the Tool Options below the image window. Selecting a tool in the Tools panel opens the Tool Options, where you can select additional tools if you’re using keyboard shortcut keys. To cycle through tools that share a keyboard shortcut, simply press the Shift key in conjunction with the key that corresponds to your desired tool until that tool is selected. For example, if the Elliptical Marquee was the last tool used, press Shift+M to return to the Marquee tool. 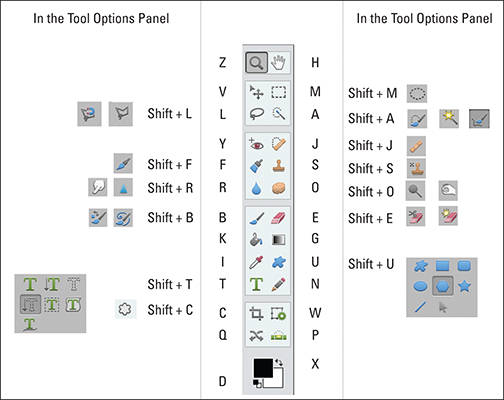 Check out the keyboard shortcut for each tool in the Tools panel, as well as which tools share a keyboard shortcut. You can change how the Shift key works in the General Preferences. If you disable the Use Shift Key for Tool Switch option, you don’t need to press the Shift key to change tools.